Is Arnold Schwarzenegger in Wonder Woman? With less than five months left until Warner Bros. rolls out Wonder Woman, fans are waiting with bated breath for this highly-anticipated superhero adventure, starring Gal Gadot as the title character. 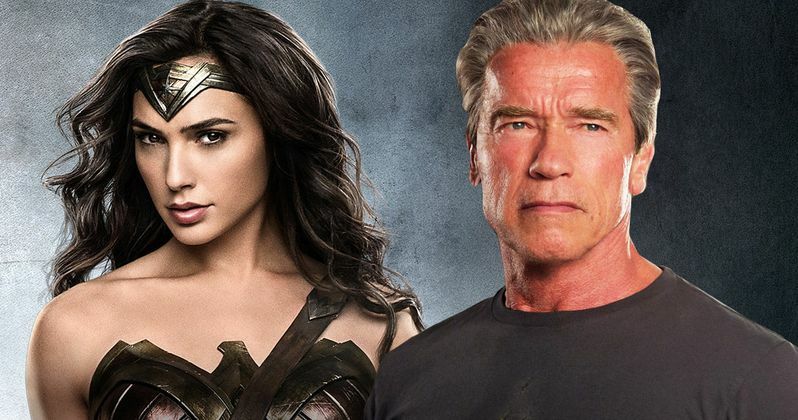 In a surprising turn of events, it seems that there may be a new casting addition, with rumors spreading that Arnold Schwarzenegger may be cast in Wonder Woman. There is no confirmation that the actor has been cast, but the recent Twitter activity of both Wonder Woman director Patty Jenkins and DC Films president Geoff Johns has some fans wondering if he's been cast in an unspecified role. ComicBook.com reports that both Patty Jenkins and Geoff Johns recently started following Arnold Schwarzenegger on Twitter, which fueled speculation that he was cast in a mystery role. The movie did undergo reshoots back in November for two weeks, so it's possible that he may have filmed his role then, but if that's the case, it doesn't explain why both Patty Jenkins and Geoff Johns started following the actor now, and not in November. Perhaps there is another secret round of reshoots happening that haven't been announced, but that hasn't been confirmed either. While the Twitter activity of actors and filmmakers isn't always the most accurate way to predict casting news, it has been proven true in the past. Many fans correctly guessed that Joe Manganiello was playing Deathstroke after a number of DC accounts started following the actor on Twitter, and there is also speculation that John Cleese has a mystery role in Justice League through similar Twitter activity. As for Arnold Schwarzenegger's supposed casting, we'll have to wait and see if either Patty Jenkins or Geoff Johns comment on this rumor through social media. There have also been recent reports that this superhero movie is "a mess," although that talk was shot down by Patty Jenkins, who denied the movie was in any sort of trouble at the studio. Still, if that rumor is true, then perhaps there may be secret reshoots taking place, which could explain Arnold Schwarzenegger's supposed casting with just five months until the release date. It's also possible that Arnold Schwarzenegger is only providing his voice for some sort of CGI creature or character which doesn't require him to be on the actual set, but that is only speculation too. Before she was Wonder Woman, she was Diana, princess of the Amazons, trained to be an unconquerable warrior. Raised on a sheltered island paradise, when an American pilot named Steve Trevor (Chris Pine) crashes on their shores and tells of a massive conflict raging in the outside world, Diana leaves her home, convinced she can stop the threat. Fighting alongside man in a war to end all wars, Diana will discover her full powers, and her true destiny. The supporting cast includes Ewen Bremner, Robin Wright, David Thewlis, Danny Huston, Elena Anaya, Lucy Davis and Connie Nielsen. Hopefully we get some sort of confirmation or denial about this latest casting rumor for Wonder Woman, which hits theaters on June 2.